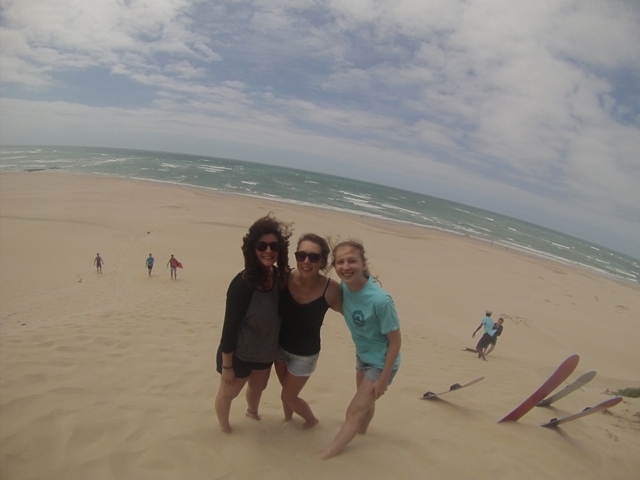 Saskia is back with some more excellent accounts of what she has been getting up to on her gap year. She is now in South Africa, taking part in our sports coaching programme and it sounds like she is having a really great time. Keep reading to find out what she has been up to on her first weekend trip of her 11 weeks of sports coaching volunteering. Exhausted, sun burnt and somewhat bruised I have made it back from my first weekend trip in South Africa! The excursion was organised by the guys at the sports coaching programe and we were accompanied by Ashy (the resident driver, front seat DJ and apparently beer pong pro) and Billy, one of our volunteer coordinators. We had an action packed plan and as usual I was keen to try everything and anything! 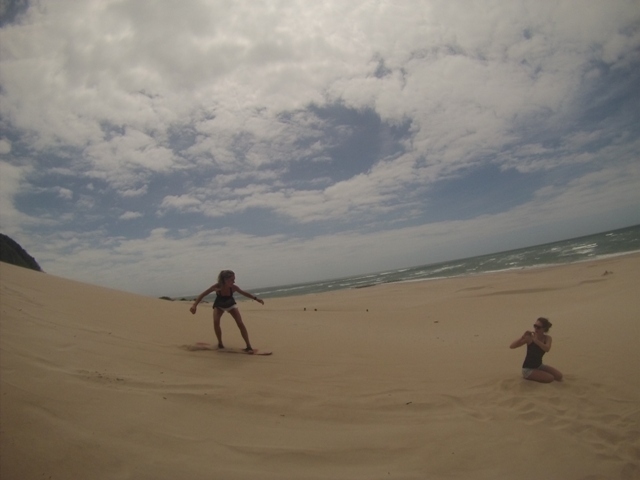 Our first activity was Sandboarding, essentially snowboarding in the heat, and although I ended up with a crunchy mouth and face mask made of sand, it was actually really fun. By the time we’d all had our share of boarding down the dunes, and a considerable work out –they really should bring cable cars to sandboarding- we headed for lunch. It was lovely to have a few hours in the restaurant by the beach to cool down and enjoy a variety of sea food and a well-deserved break before we continued to the hostel. Dom had organised for us all to stay at a place called “island vibe”, I would recommend this to anyone who’s ever in Jeffery’s Bay it was amazing. Every room looked right out onto the beach and along with a bar, a games room and plenty of likeminded backpackers, this made for a great set up. They also provide organised activities and helped us to arrange our next activity for the day, horse riding. I think it’s safe to say the ride was incredible! 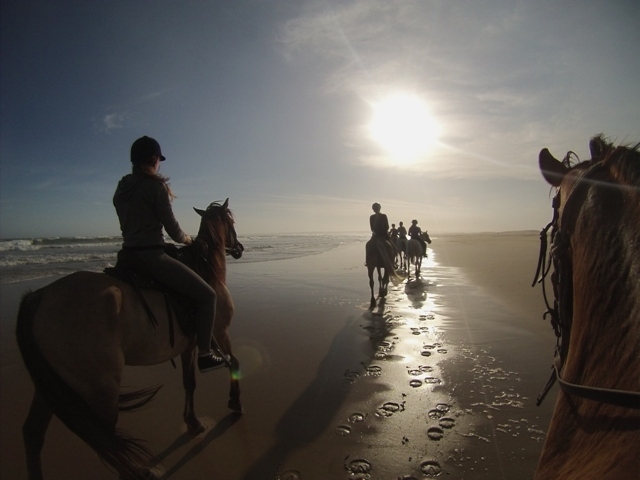 Somehow everything was perfectly timed so that we emerged from the sand dunes just as the sun was setting, and we were cantering along the beach right by the water. My trusty horse Ketchup and I made a great team, however Megan and Trudy didn’t have quite the same bond…. she ended up on the floor! But fret not she got straight back on and proved her point to her rather moody horse, providing us all with a good laugh. We made it back to the hostel for around 7 and I had the most amazing Hawaiian pizza I have ever eaten! This set the evening up nicely and we all had a great time meeting the other people staying for the night and consequently beating them at numerous games- we are sports volunteers after all! The following morning we were all up bright and early, some of us slightly worse for wear, but ready to surf! I was told Jeffery’s Bay is one of the best surf destinations in the world so this opportunity was not one to be missed! We had an awesome instructor named Gabriel and by the end of our two hours had all just about managed to briefly stand up and pose for a photo. Again this was super fun and finished off the trip nicely as this was our last activity of the weekend and it was then time to head back. If this sounds too good to miss why not check out our website to learn all about the sports coaching project and the fantastic free time opportunities that you will have whilst on the project. Other activities are included in the price that you pay too, such as a township tour, braais (South African BBQs), traditional dancing and more!